DOMAPARIS S.A.S Company, Simplified Joint Stock Company with capital of 25.000 €, with its main office located at 55 Boulevard Pereire, – 75017 PARIS, is registered with the Clerk of the Commercial Court of Paris under number SIRET 751 630 013 00017, domiciliary company with Prefectoral authorization issued on June 19, 2012 n° DOM2010291 to the regime of article L123-11-3, in accordance with article R1236168 of the Code of Commerce , represented by Yveline CREPEAU, President. The subscriber concludes the contract of domiciliation, service provision or office provision according to the terms of general conditions of online transactions indicated below. 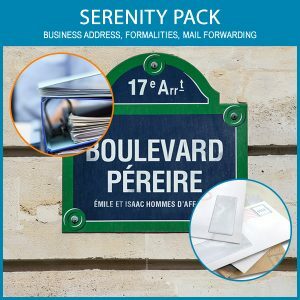 By subscribing to one or more services offered on Domaparis.com, the Subscriber acknowledges having read these general selling condition and confirms their agreement with them. The Subscriber agrees to effectively and exclusively use the premises either as the main office of the company, or as an agency, branch or representative office. DOMAPARIS waives all responsibility regarding the content of the mail and can transmit the mail to any person designated by the Subscriber, in writing. -Power of attorney required to receive your registered letters. From 9 AM to 5 PM, Friday. DOMAPARIS reserves the right to modify these hours and agrees to inform the Subscriber of this five days before the change of hours. The Subscriber may, if he wishes, benefit from additional services (hereafter the « additional Services »). These services are invoiced in addition and, in certain cases, may involve the preparation of a prior quote. For information purposes, the list and prices of the services are presented in our website www.domaparis.com at the request of the customer. All of the Additional Services are subject to the availability of the personnel of DOMAPARIS at the time when the service is requested. DOMAPARIS will do everything in its power to respond to requests for service as quickly as possible, but DOMAPARIS cannot, in any event, be held responsive for possible delays. For any purchase made online, the web-customer chooses the package or products that suit him and confirms his subscription by clicking on “subscribe online”. * This package is not eligible for any company whose legal representative resides abroad. In this case, the following priority pack will automatically be applied in accordance with the regulations governing the domiciliation profession, which requires that postal mails be recorded on a regular basis. 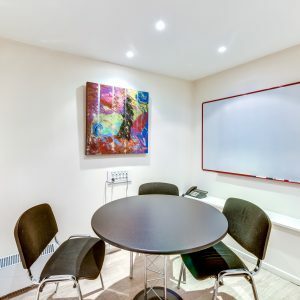 DOMAPARIS offers a fully equipped meeting room, equipped with a projection screen, a wall panel and Wifi connection at a very competitive price. After selecting your desired services, the law requires a number of steps for the finalisation of the contract, in particular the “double click” procedure. DOMAPARIS website will then show you the selected items available in your basket In accordance with article 1369-7 of the civil code a second validation of the order will be shown before completion. Thereafter, renewable for periods of a firm duration of 12 months. The parties to the contract can terminate the contract in writing with notice of 3 calendar months (with the postmark as proof) sent by either of the parties by registered letter with return receipt requested before the expiration of each period of 12 months. This contract cannot be terminated early outside of the contractual time periods and without the notice periods indicated in this contract. All of the parties expressly agree that in the exceptional event of an early termination as provided for by article 7 of the Contract, the Subscriber must pay DOMAPARIS compensation. Depending on the benefits selected by the subscriber, the monthly fee is payable in advance, quarterly or annually. See current rates on our website. Priority Pack included requires an advance of 100€ plus VAT for 1st stamping cost or digitization fees, which are then included in your accounts in terms of the real cost and adjusted according to your consumption of your services. In addition to the Fee, additional services will be invoiced monthly, at the end of the month and according to the prices in effect and appended to the contract. If this contract, by initial subscription or by renewal, is for a period greater than one year, the first annual revision of the fee will take place on the 1st day of the anniversary month of the signing of this contract. On this date, an increase of 5% will be automatically applied to the amount of the initial fee, and thereafter, the 1st of January of each year. This annual indexing corresponds to the general increase in prices, services, taxes, and the change in the cost of living index over one year. The Fee is payable annually in advance by direct transfer on the due date and upon presentation of the invoice. On the 1st of each month or on the closest date, DOMAPARIS will issue an invoice for the additional services. This invoice is to be paid within five days of its receipt. All late payments, after a prior reminder notice that remains unpaid, will result in an increase in the sums due calculated at a rate of 0.05% per day after due date (law 92 – 1442 of December 31, 1992) without this presenting an obstacle to the application of the provisions of article 7 Cancellation clauses. This will automatically lead to invoicing of the various expenditures involved and the time spent to collect of the sums due. Payments should be made to the order of DOMAPARIS. The expenses for payments by foreign bank transfers, if any, will be borne by the Subscriber. In the absence of payment, DOMAPARIS reserves the right, expressly acknowledged by the Subscriber, and after a follow-up procedure, to suspend all services, understood to be the included services and the additional services. As an advance on consumption, a sum, corresponding to 3 months of ancillary fees including VAT is to be paid upon the signing of the Contract by the contracting party in addition to the standard quarterly fees, only for Subscribers who decides to pay on a quarterly basis. This advance on consumption is not required for subscriber who pay on an annual basis. This advance payment is an essential condition of the contract without which the contract would not be granted, and must therefore be paid before the commencement of said contract. This advance will not produce interest to the benefit of the Subscriber. It is agreed that in the event of a variation of the Fee in execution of the indexing clause provided for in ARTICLE 4 – INDEXING OF THE FEES, the sum paid as an advance must be adjusted to be in commensurate with the new Fee so that it is still equal to 3 months of Fees including VAT. This sum will be held throughout the duration of the contract and will be used to cover operating costs of the three months left as long as the subscriber proves to DOMAPARIS that the Main Office transfer has been actually recorded. In the event of early termination of the Contract, the Subscriber is informed that the advance on consumption paid under the contract will be immediately reallocated as an advance on the compensation due as a result of the earlier termination mentioned in article 2 of the Contract – Duration- and in accordance with article 7 – cancellation clauses. Compensate DOMPARIS for all costs, losses and damages that DOMAPARIS must bear because of the termination. The subscriber still owes DOMAPARIS for the execution of all of the commitments of this contract and the additional services subscribed. As a reminder, in the event of early termination of this contract, the advance on consumption, defined in article 6, is allocated as an advance on the fees due as a result of the early termination mentioned in article 2 of the contract – Duration –and in conformity with article 7 – Cancellation clauses. The termination will be effective 8 days after formal notice has been ignored and the fees remain outstanding (sent by registered letter with return receipt requested), duly addressed to the person at the official address indicated in the contract or at the main office of the company. DOMAPARIS may instigate this cancellation clause, if payment proposals have not been agreed by both parties before the deadline for termination. This is without prejudice to all damages that could be claimed from the defaulting party. The subscriber also agrees to pay all the costs, including reasonable legal fees that DOMAPARIS might have to pay for the forced termination of its Contract. These provisions constitute an essential and decisive condition of this Contract, without which it would not have been granted. The Subscriber must pay in a timely manner all taxes and levies that apply to them legally or based on their activity, especially the business tax. It is not possible to post any signs in the building. The co-ownership rules of the building forbid all signs. Within the framework of the subscriber’s activity, they must respect all laws and provisions in effect. It is not permitted to carry out any illegal activities. The use of the premises is only authorized as office space and only within the framework of the activity mentioned in the Contract or any other activity that DOMAPARIS specifically authorizes at a later date. The Subscriber will not undertake any activity that competes with those of DOMAPARIS. DOMAPARIS provides no guarantee regarding the obtaining of the necessary administrative authorizations of whatever kind. The Subscriber must personally obtain all of the necessary authorizations for carrying out his business activities at his own expense, risk and peril. DOMAPARIS cannot assume any responsibility in the event of a refusal or delay in the obtaining of the authorizations. The Subscriber acknowledges that DOMAPARIS will not be liable for any losses, damage or complaints other that in cases of its own gross negligence. If it is held liable, DOMAPARIS may not in any circumstance be held responsible for any consequential losses, any loss of business, profits, foreseeable savings, damage or loss of data, complaints from third parties or any other resulting losses. DOMAPARIS cannot be held responsible for any consequences that result from its failure to provide the services of this contract to the Subscriber due to breakdowns, strikes, or cases of Force Majeure where DOMAPARIS is located, except in the event of its obvious negligence. – That could come from a third party in relation to the use of the offices, if the Subscriber does not respect the terms of the Contract. The domiciliation operation takes place through the realization of two complementary and indissociable contractual operations which are the commercial address contract and the contract for the use of the offices. There can be other services in addition to these two operations. These operations are subject to the regime of article L.123.11 of the Code of Commerce. The intermittent use of the premises put at the disposal of the Subscriber excludes the application of the status of commercial leases. The Contract is the equivalent of a hotel contract which does not give the Subscriber any right to the property but simply the right to have the use of the premises so that DOMAPARIS can provide the Subscriber with a set of services. 1 ° The domiciliation agent must during the occupation of the premises, be registered with the Trade and Corporate Registry or the Professional Registry. However, this condition is not required if the domiciliation agent is a French public law legal entity or an association that includes French public law legal entities. The domiciliation agent makes available to the domiciled person/entity premises that have a specific room to ensure the necessary confidentiality and to allow for regular meetings of the bodies in charge of the management, administration monitoring of the company and also the maintaining, conservation and consultation of the ledgers, registers and documents required by the laws and regulations. The domiciliation agent holds, for each person/entity domiciled, a file containing the supporting documents concerning the residence of its legal representative and their telephone number as well as each of its places of activity and the place where the accounting documents are kept if they are not kept at the premises of the domiciliation agent. They must inform the court clerk, upon expiration of the contract or in the event of its termination, of the ending of the domiciliation with DOMAPARIS. If the person domiciled in their premises has not collected their mail for three months, they must also report this to the court clerk or the Chamber of Trade and Artisanry (CMA). They give bailiffs/process servers who have a writ of execution the specific information making it possible to contact the domiciled person. Every quarter, they give the tax bureau and the organizations in charge of collecting social security contributions a list of the people who are domiciled in their premises during this period or who ended their domiciliation and also every year, before January 15, a list of the people domiciled as of January 1. 2° The domiciled person/entity takes on the commitment to effectively and exclusively use the premises either as the main office abroad or as an agency, branch or representation office. They recognize that they are bound to inform the domiciliation agent of any modification concerning their activity. they also take on the commitment to declare any changes relating to their legal form and company purpose and also the names and personal residence of the people who have the power to make commitments in the company’s name on a usual basis. The domiciled person authorizes the domiciliation agent, who accepts this, to receive all notifications in his name. All of the deadlines are firm are counted in calendar days and start as of the receipt of the notifications (with the postmark as proof). Notifications made by registered mail with return receipt requested are assumed to have been made on the date of their first presentation at the address of the recipient. This contract represents the entire agreement between the parties with regard to the operations covered by this contract. These documents take precedence over all earlier negotiations, discussions, communications, understandings and agreements between the parties regarding the subject of this contract, and all earlier draft agreements, which are all mentioned in these documents. The appendices of this Contract are an integral part of it and are indissociable. This contract will be considered divisible, and the nullity or impossibility of carrying out any term or stipulation of it will not affect the validity or the enforceability of this contract or of any other term or stipulation of it. Furthermore, in the place of any null or not legally-binding term or stipulation, the Parties will substitute for it a valid and legally-binding stipulation as close as possible to this null or not legally-binding stipulation. The revelation of certain information being required by any competent authority by virtue of a legal or regulatory obligation. This obligation applies to the parties throughout the duration of this agreement and for a period of two years after the termination of this contract for whatever reason. DOMAPARIS can freely transfer this Contract to the benefit of any company controlled by it, controlling it or placed under the same control as it. The term « control » or the verb « to control » interpreted in accordance with article L. 233-16 of the Code of Commerce. It is expressly agreed between the Parties that the Commercial Court of Paris will be the only court of competent jurisdiction for disputes that may arise with regard to the Contract. Should a provision of the actual contract be cancelled, its nullity will not affect the validity of the domiciliation contract in its entirely.